I recently updated to Xcode 8 and as I click on "download" option next to provisioning profile in Xcode/Preferences/Accounts/View Details menu it changes to gray and does not download. After restarting Xcode the download button is again clickable and the problem persists. 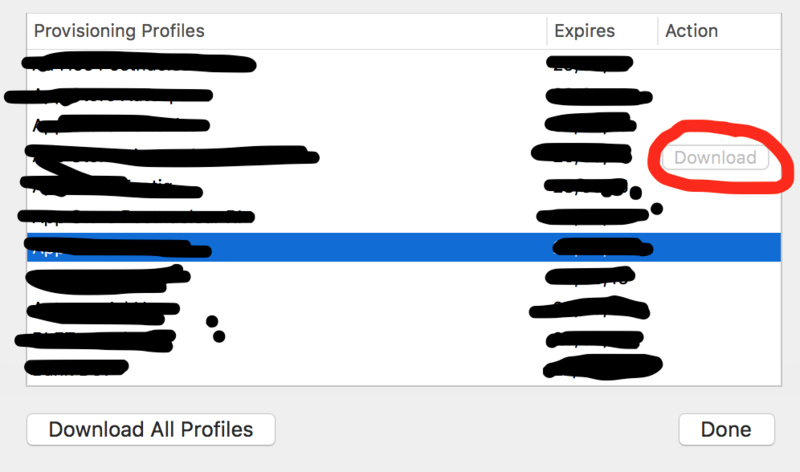 Manual download of provisioning profile and dropping on Xcode icon don't add the profile to specific developer account in Xcode 8. Anyone had this problem recently and solved it? I checked all questions related to new Xcode version, still no solution. I'm seeing the same issue where the download button is grayed but the download never seems to complete. Drag the downloaded profile onto Xcode's icon in the dock. At this point, your profile will be installed on your Mac and usable within Xcode. For the OP — if manually installing the profile this way didn't resolve the issue, then you're likely seeing another configuration problem or a bug. Could you clarify what you saw after you manually installed the profile and selected it in the General tab — did you get a build error or other issue? In mu case the issue started appearing after I added Push capability(I checked the push notification toggle button in target->capabilities) If I go and uncheck that then I can build and upload to app store. I was having this same issue. Here is what I did that solved the problem for me. First I right clicked on each of the two profiles that would "grey-non-download" and moved to trash. Then I deleted the developer account within Xcode. I re-added the developer account, went back to details and download all. It worked for me, hope this helps. Its doesn't sound much but it really worked for me. Just right click on the provision profile and click on Show in finder. Then delete all the provision profile in the entire folder. Not goto Xcode project settings and Check the checkbox, Automatically manager signing. The xcode will do the rest for you. I've had this issue too, and have had some success with renaming the profile. For example, it used to be named "[App Name] Dev", and no matter what I did, renewing, deleting and recreating with the same name, manually installing it, it just would not work at all. Until I renamed the profile to "[App Name] Development". Type defaults delete com.apple.Xcode and press "Enter." This deletes the customised settings set up. Type rm -rf ~/Library/Application\ Support/Xcode and press "Enter." This removes the configuration folders as well. Download provisioning profile directly from developer account and double tap on it, it will get install in xcode. Then select the provisioning profile you want to use, then it details of the profile you can see Profile identifier. Copy that Profile identifier and open xcode. Navigate to the code signing identity and there in provisioning profile select others and paste the copied Profile identifier. And I was trying to deploy a development version using the value production instead of development. Changing that value did the trick. And you really need to try to build with Automatic Signing first then remove it, it seems can't be downloaded with button, for now just ignore the download button from this page, but better to use the dialogs while you try to build. And always Quit Xcode and Re-open it after almost each action you do, After wasting like 2 days, I made it work like this ! I solved it by creating my own development certificate (In Xcode) and assigning it in the development provisioning profile. After I download and double click it I was able to get it working fine. Not the answer you're looking for? Browse other questions tagged provisioning-profile xcode8 ios-provisioning or ask your own question. How to check whether Xcode downloaded all profiles?